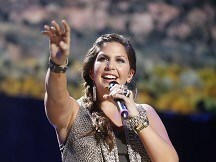 Lady Antebellum has announced the sudden postponement of an Ohio concert due to a death in the family. The country music trio says on its website that band member Hillary Scott's grandmother has died, so the Grammy-winning group won't perform as scheduled Friday night at the Toledo Zoo Amphitheatre. The sold-out show has been rescheduled for August 10. Lady Antebellum has said it still plans to appear Saturday night at a music festival in Sarnia, in the Canadian province of Ontario. Boyband The Wanted have claimed their second number one single after their latest offering, Glad You Came, entered the charts in prime position. Pop group Take That have had to cancel a show after Robbie Williams suffered food poisoning, according to the band. Jennifer Lopez and Marc Anthony have announced they are breaking up.The two married in 2004 and have three-year-old twins, Max and Emme. A hearing officer is still making his mind up over who should be allowed to use the band name Bucks Fizz. Bucks Fizz fans were left "disappointed" to discover they had booked tickets for a band featuring only one member of the original line-up, a trademark hearing was told. The son of Pink Floyd guitarist David Gilmour has been jailed for 16 months for going on a drink and drug-fuelled rampage at a student fees protest.